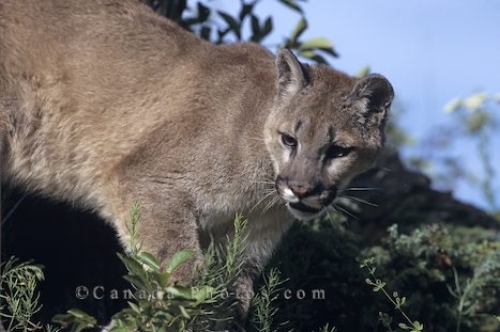 The cougar is a stunning looking animal and we were lucky to capture this picture in the wilderness of Vancouver Island in British Columbia. The cougar is always alert and keeps a good watch out for any smaller animal that might mean a healthy snack for this very powerful cat. Lucky for us, this cougar was not too interested in what we were doing and it was the perfect opportunity to capture a picture or two of this animal in the wilderness of Vancouver Island in British Columbia, Canada. Picture of a cougar eyeing up a small animal for a meal in the wilderness of Vancouver Island in British Columbia, Canada.